November has arrived and that means Thanksgiving is in a few weeks. Eeeekkkk. Hosting dinner or attending one? Either way you will want to look sophisticated and put together for the table feast photo. If you don’t have time to go shopping for a new dress, no worries and no need. We are willing to bet that you have a Little Black Dress (aka LBD) that you love hanging in your closet. Most of us do and the always-chic, ever-slimming LBD is the perfect choice for Thanksgiving, especially since we tend to overindulge at the table and, with kids around, there’s a 50/50 chance something will spill or get wiped on us. And, if we’re being honest, we’ll admit to the fact that we polished off the remainder of the Halloween candy, so we’re already going into turkey day with a few unacknowledged pounds under our belt… Where’s the squat challenge when we really need it??! 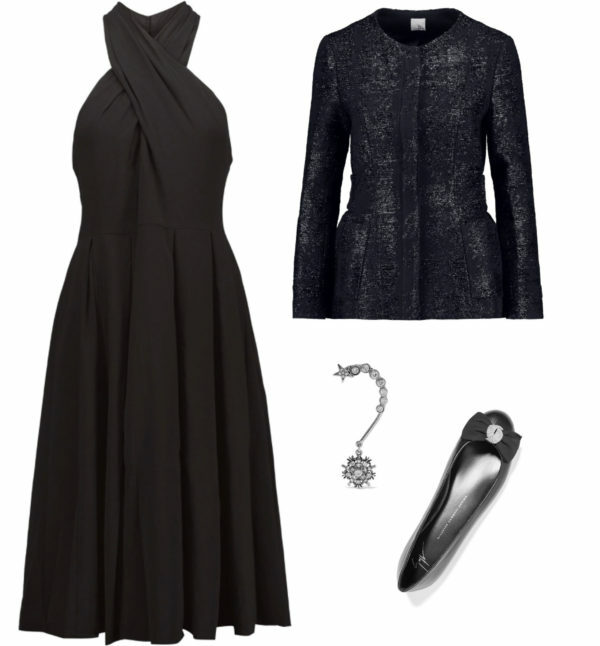 We digress… Here are a few easy ways to update your LBD for turkey day. 1 | Style with a statement necklace. 2 | Layer with a tailored jacket. 3 | Cover your gams with textured tights. 4 | Add a dressy choker. 5 | Special shoes make everything new.